So, most troubleshooting, involves getting the correct information, so you can even begin to look into a problem. 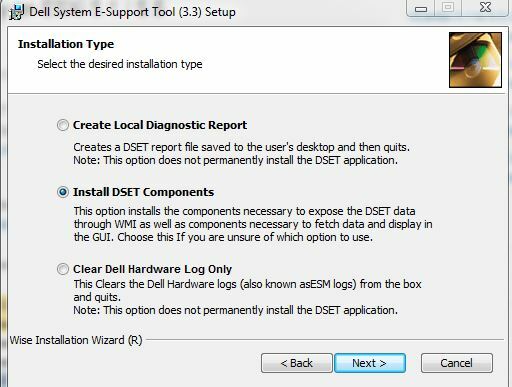 Many application related issues, stem from a hardware issue, thus if you use Dell hardware, many times you will be asked to generate a DSET (Dell System E-Support Tool) report from the server in question. Dell System E-Support Tool (DSET) is a utility that collects configuration and log data for various chassis hardware, storage, software, and operating system components of a Dell PowerEdge server and consolidates the data into a .zip file. On a Windows server, this is an easy task. Simply install the executable on the server, and run it inside of Windows. EasyPeasy, and no outage..
On ESX however, not quite so simple. There is a way, to simplify the process, with only a single maintenance outage, and after complete, a DSET can be collected remotely from any other Windows system in your environment. These instructions will walk you through installing the prerequisite package on the ESXi host, and then the running of the utility from the Windows machine. Install the Dell OpenManage Offline Bundle and VIB for ESXi. At the time of this writing, the version was 7.2, released on 3/31/2014 – http://www.dell.com/support/drivers/us/en/19/driverdetails?driverid=MMPDK Note – The OpenManage Server Admin Users guide is helpful with the installation, however, I will outline the steps below. Shut down all guest operating systems on the ESXi host and put the ESXi host in maintenance mode. Enter the root username and password of the ESXi host when prompted. The command output displays a successful or a failed update. Restart the ESXi host system. Do this for all ESXi hosts you may want to gather this information from. Once downloaded, run the installer, and move the bubble to Install DSET Components. 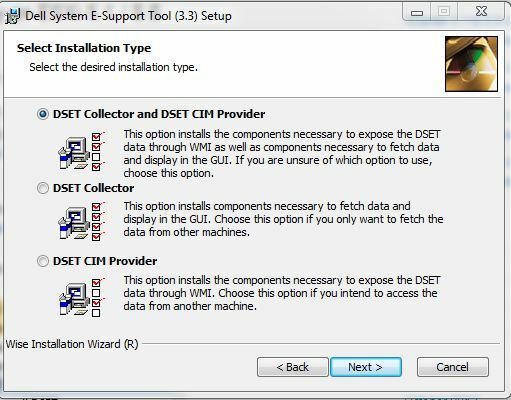 And then select the first option to install the DSET Collector and DSET CIM Provider. After installation has completed. Open the CLI from your Program Files. DSET will collect the data, and wrap it into a zip archive. Upload that archive, and troubleshoot away!